Click the image to watch "Radiological Defense," a 1961 film on fallout protection by the Office of Civil Defense. A nuclear bomb detonates. The blast destroys everything in a one to three mile radius. It vaporizes millions of tons of solids—earth, buildings, plant and animal life—and propels them into the troposphere, as high as 15 miles skyward. Carried by the wind, this cloud of radioactive material may spread far from the location of detonation, sometimes hundreds of miles. The deadly detritus showers down in a dry and lethal rain for days or even months afterward, with particles so small as to be invisible. This is fallout. Even brief exposure to fallout radiation may prove fatal. For this reason, fallout can be much deadlier than the fire and heat from the detonation itself. At the climax of the Cold War in the 1960s, the U.S. launched a nationwide campaign to protect citizens from the dangers of fallout. 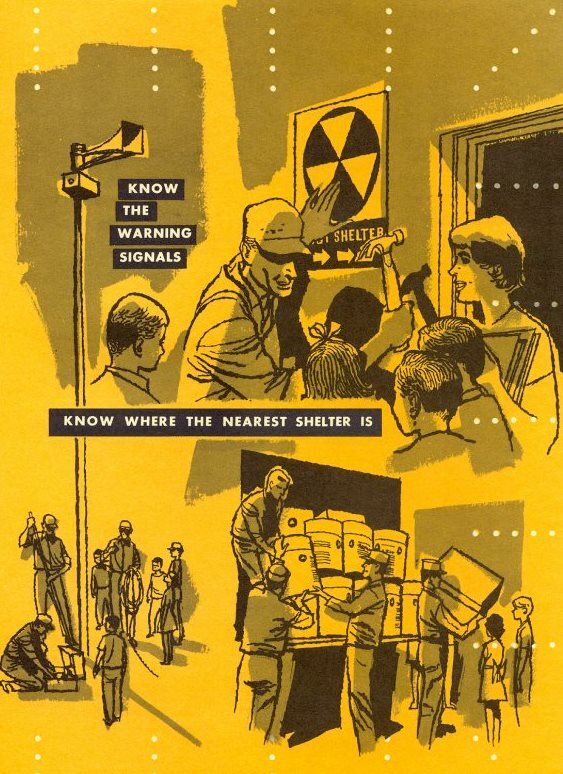 Like other American cities, Washington, D.C. readied hundreds of fallout shelters to safeguard its population. 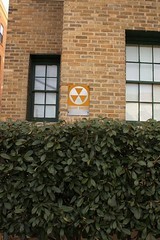 At the height of the Cold War, Washington, D.C. was at the center of civil defense preparations. The city would prepare over a thousand public fallout shelters in the 1960s, at one time more than any other municipality in the country. However, since the capital was a primary target in the event of nuclear war, Washington’s efforts were more about providing what Hansen termed “emotional security” for denizens of the District. Fallout shelters would have been useless in the event of a direct attack since they were meant to protect the populace from radioactive fallout but not the blast itself. Nevertheless, scores of D.C. shelters were marked by luminescent black and yellow signs, stocked with provisions for hundreds of thousands of people and located in over a thousand public and private buildings throughout the city. Click the image to expand timeline. 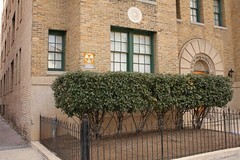 Fallout shelter sign, FTC Building, Constitution & 7th NW. 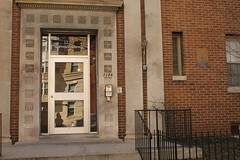 Today, only a fraction of the now faded fallout shelter signs remain on D.C. facades, including apartments, churches, schools and federal buildings. The terrifying significance of the sign has since faded as well, but not its historical importance. 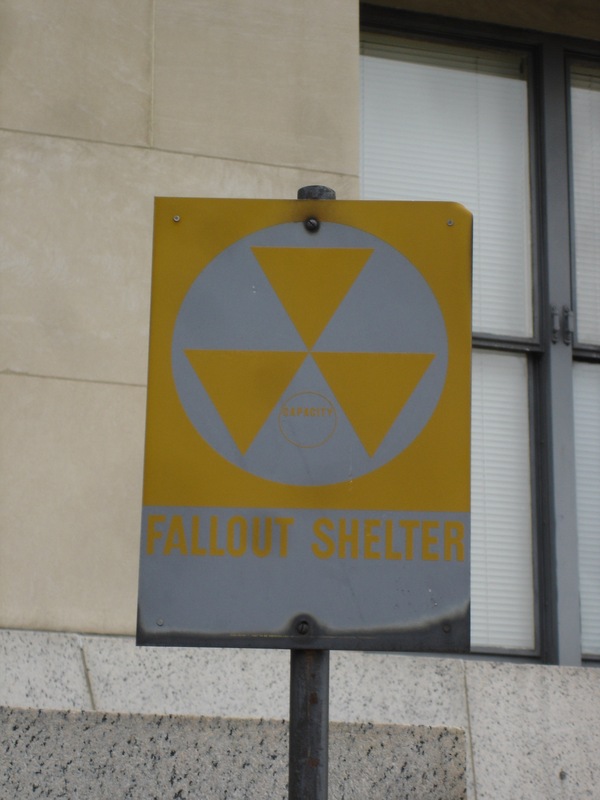 Fallout shelter signs in the District of Columbia must be preserved as monuments to one of the most frightening periods in American history and as a reminder of the threats we still face today. “Fallout!” The Washington Post, October 23, 1960, p. I2. Community Shelter Plan Study for Washington, DC, Volume I: Plan Study and Recommendations, Washington, D.C.: Government of the District of Columbia, Office of Civil Defense, 1965, 1-2. Krugler, David F. This is Only a Test: How Washington, D.C. Prepared for Nuclear War. New York: Palgrave Macmillan, 2006, 9. “Schools Must Raise Funds To Stock Fallout Shelters,” The Washington Post, November 1, 1962, p. B1.